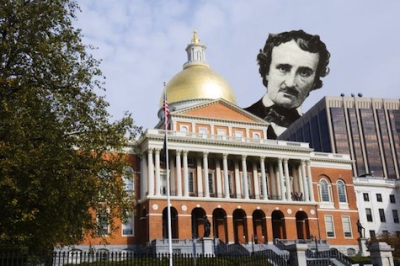 Poe picked a lot of literary fights in his career, but none greater then with “the Humanity clique” of New England, which included Harvard professor Longfellow and Transcendentalists Ralph Waldo Emerson and James Lowell. Class resentment drove his hatred of these “elegant men of leisure” and he denounced Beantown while still desiring its acclaim. He despised, as he understood it, the Transcendentalists’ optimism and their belief in social progress. He sued Longfellow for plagiarism and pulled Andy Kaufman-like stunts by giving boring never-ending lectures to Boston audiences and then claiming they were too stupid to understand his genius. All of this is either bitterly ironic or psychologically understandable given that he was born in the city, and that his first collection did not carry his name. Instead, authorship is credited to “A Bostonian.” The book flopped. 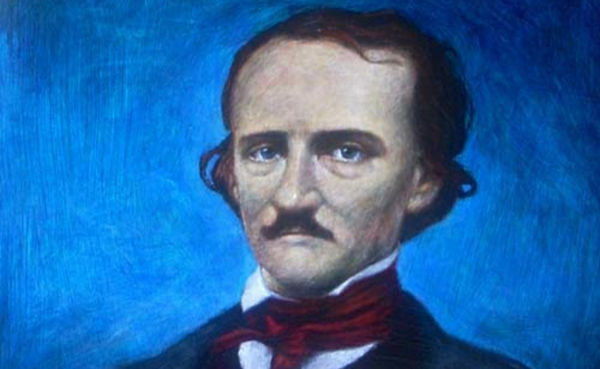 It’s fairly well known that Poe married his cousin Virginia and that her subsequent illness inspired much of his work, but perhaps one of the most direct correlations to his work came with the first signs of her tuberculosis. While singing for the family, Virginia’s lungs hemorrhaged, and she began bleeding from the mouth. Soon after, in a deep denial about the severity of her illness, Poe wrote the tale of decadent Prince Prospero, locked in his castle and trying, in vain, to keep the specter of pestilence, disease, and injury from his doorstep. 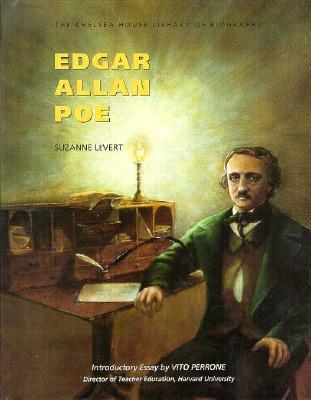 Detective fiction, American Gothic tales, science fiction  Poe is given credit for inventing all these genres, but two of his lesser known tales, “The Facts of M. Valdemar’s Case,” and “Hop-Frog” provide good evidence that he cultivated his inner gore-hound; and Virginia’s illness no doubt continued to feed his fear of physical illness. The violence of “Usher,” “Pendulum,” “Tell-Tale Heart,” and “Black Cat” are wrapped in gothic romance, but the deaths in these other two are flat out disgusting. David Cronenberg would be proud. Genre fans know that H.P. Lovecraft picked up where Poe left off. Perhaps his most direct homage to the master is the strange cry of “Tekeli-Li! Tekeli-Li!” first heard at the end of Poe’s only novel, The Narrative of Arthur Gordon Pym, the story of a strange expedition to Antarctica. Lovecraft incorporated Tekeli-Li into his Arctic novella, “The Mountains of Madness” making it the call of the Elder Ones. He also borrowed Poe’s giant penguins and made them whisper it, too. There’s also the 2011 novel Pym by Mat Johnson, which is a full-on Poe homage/satire. We can’t image him without it. (John Cusack gets a devilish goatee in the new movie.) But the handsome devil on the right is the same man who wrote about premature burials and orangutans shoving women up chimneys, and it’s how he looked most of his life. Only in the much darker, desperate, final years did he grow that romantic, brooding facial hair and begin to go mad. Poe thinking crazy thoughts5.) Eureka! an infinitude of pulsating universes alternately willed into orbic systems and reactively condensed into primary particles by an infinitude of gods.” If you can explain that me, I’ll buy you a beer and call you Aristotle. Or, as it was known in the 19th century, the Sons of Temperance. And it wasn’t anonymous. Members took a public pledge against alcohol and published their intentions in the newspaper. 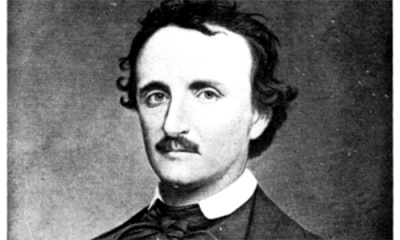 Poe joined a branch in Richmond, VA amid rumors that he might be marrying his childhood sweetheart, Elmira Shelton. Time to get sober. But he died a month later before he could climb the 12 steps to recovery. 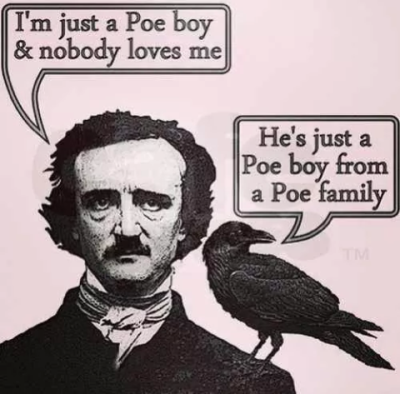 Do you think you know how Poe died? Guess what? So does everyone else. His final days in Baltimore have inspired more hokum and conspiracies then Tupac, JFK, and Elvis combined. (Okay, we really can’t measure that, but it feels this way.) There are over 26 theories including rabies, diabetes, epilepsy, carbon monoxide poisoning, alcohol dehydrogenase, and cooping. That last one gets my vote. It was a common practice in our young Democracy to abduct isolated people during city elections, ply them with liquor, and then force them to vote multiple times. This would explain Poe’s delirious state when found in a Baltimore tavern  which doubled as a polling site  and the fact that he was wearing clothes that were not his. 1.) Contrary to the famous and nasty depiction of a man gouging the eye of a poor feline in “The Black Cat,” Poe adored animals. His own kitty’s name was Caterina.